One thing that is often bothering me about Maven is the extensive logging of download messages. Usually I am not interested in these messages unless something is really wrong, and then it is important to know, which URLs are accessed for download. Before Maven 3.1 there were only poor chances to influence this behavior through the CLI. There were the options “-q” (quiet) and “-B” (batch mode), which influence the TransferListener implementation used by the Maven main class MavenCLI. With Maven 3.1 it was decided to use SLF4J as logging API. When using batch mode (-B), Maven will use Slf4jMavenTransferListener for logging, which is determined by method getBatchTransferListener(). All info level transfer messages will be suppressed, but this would also cover upload messages when deploying artifacts. As a result, all transfer messages will be redirected to file “mvn_transfer.log”, while all other messages go to the console. The Fornax Workflow plugin is a Maven Plugin that executes MWE/MWE2 workflows within Maven. It has been there for quite some years now, and whoever needed to integrate MWE/MWE2 workflows in a headless build was likely using it. The Fornax Platform has been an address where components around openArchitectureWare, Xpand and Xtext have been developed. While all other subprojects don’t play any role anymore, the Workflow plugin is still in frequent use. Over the years we had to change the underlying infrastructure some times. The plugin was hosted on the project’s own repository server, and projects using the plugin had to configure an additional plugin repository either in their POMs or settings.xml. This was undesired, but at the end not really a blocker. However, with a recent change of the repository manager, users experienced problems accessing the Fornax repository http://www.fornax-platform.org/nexus/content/groups/public. Currently, this URL is redirected to a server hosted at itemis, and users might get problems with the HTTPS connection. It always bothered me that we had to host this plugin on a separate repository, and since it is a widely used component, it is logical that it should be available from the Central repository. But it was never a blocker for me. Now finally I got the driver to change this. Long story short, the plugin is now published at Maven Central as version 3.5.1. I highly recommend to upgrade to this version and remove the Fornax Maven repository from your configuration. The coordinates did not change, they are still org.fornax.toolsupport:fornax-oaw-m2-plugin. I would like to change this sometime in the future (e.g. the name parts “oaw” and “m2” are not up-to-date anymore), maybe with moving development to another project hosting platform. Version 3.5.1 does not differ much from 3.4.0, which is the version likely used by the world today. The main work was on refactoring the POM and its parent in order to meet the requirements for deployment on Maven Central. Further, I worked on automation of the release process with the maven-release-plugin. There is one additional feature in 3.5.x: The new property useTestScope can be used to skip dependencies from the test scope for computation of the Java classpath used to execute a workflow in forked mode. On Windows systems the classpath sometimes reaches the limit of allowed command line length, especially since the local Maven repository is below the user’s home directory by default, which has already a rather long path prefix. By default, the plugin will exclude now these test scope dependencies unless the user configures the property explicitly. In 3.5.0 there was a small logical bug with this feature which made the plugin unusable, so please do not use that version. The version 3.5.1 can be used without problems for all using 3.4.0 so far. Finally I have managed to release a new version of the Fornax Maven Workflow Plugin again. This Maven plugin allows execution of MWE and MWE2 workflows from Maven, which is typically the case if you want to automate the build of Xtext or Xpand based projects with Maven. I have especially to thank Dieter Schulten from escalon, who has been willing to contribute to this release. He has mainly contributed the m2e configuration and some tests for the plugin. In my previous post I showed how to use the maven-xtend-plugin to compile Xtend sources within a Maven build. This worked fine in simple cases, but there was a limitation of only one supported source directory (the one configured by build/sourceDirectory property), see Bug#367914. Unfortunately already each Xtext project has already 2 source folders (src and src-gen), so this made the plugin unusable for Xtext projects and forced checking in the generated Java files. This causes terrible problems with version control, especially when working on a team. In the meantime Bug#367914 was resolved, but only for the upcoming Xtend 2.3 (Eclipse Juno) version. This urgent bugfix was not available on a Maven repository. But I needed it for project Spray to finally get rid of the merge conflicts and delete the generated sources from the repository (issue#94). Spray is still using Xtext/Xtend version 2.2.1 and depends on public available Maven artifacts. Since the bugfix won’t be available from the Xtend project for the 2.2.1 release and Eclipse Juno is still some way to go I decided to backport the current 2.3.0 M6 sources of the Xtend Maven Plugin to 2.2.x and create an unofficial version 2.2.2. This plugin I have deployed to the Fornax Repository to make it public available. For an usage example refer to the POMs of project Spray: pom.xml, parent pom.xml. 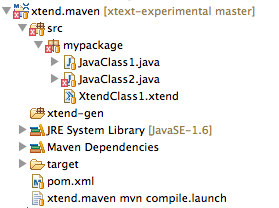 I cannot tell how often I was asked since introduction of Xtend2 how to compile them in a Maven build. This was just not possible until now due to the problem that to load and compile an Xtend class it is necessary to compile all of the Java classes that the Xtend class on before, and Java classes might depend on Xtend classes to be translated in order to be compilable. Xtext 2.2.0 was just released yesterday, and for me the most important new feature is direct support through the xtend-maven-plugin plugin. I could not hesitate to test this feature, and created a small example. I have set up a small Maven project with 2 Java classes and 1 Xtend class that depend on each other. To translate XtendClass1 to Java code and compile it requires that JavaClass1 is compiled before, and to compile JavaClass2 it is necessary that XtendClass is translated to Java code before. I have decided to not use Maven Tycho for this example, and use the typical structure of an Eclipse project with usage of Xtend, i.e. 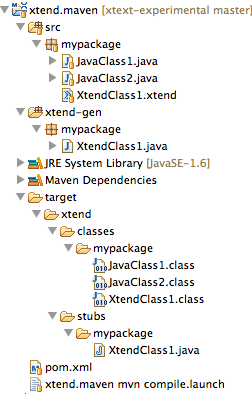 sources in folder /src (instead /src/main/java) and xtend-gen to generate the Java code for Xtend classes to. The main source folder src/ can be configured with the build/sourceDirectory setting, for xtend-gen we need the support of the build-helper-maven-plugin. The xtend-gen folder must be emptied when executing mvn clean, this requires some additional configuration of the maven-clean-plugin. The outputDirectory is optional, but leaving it out the sources are generated to src/main/xtend-gen, and we want to generate to xtend-gen in the project root. The plugin does not define a lifecycle mapping for M2E, which leads to an error marker “Plugin execution not covered by lifecycle configuration”. This is a well known issue when using M2E, and requires some additional work on the plugin. I have opened Bug#366118 for this. [INFO] Source directory: /Users/thoms/git/xtext-experimental/maven/xtend.maven/xtend-gen added. From the output it can be seen that at the end 3 Java classes are compiled, after the xtend-maven-plugin created the Java code for the Xtend class. The plugin invokes the Xtend Batch compiler through a spawned JVM. The batch compiler is realized in class org.eclipse.xtext.xtend2.compiler.batch.Xtend2BatchCompiler from the newly added plugin org.eclipse.xtext.xtend2.standalone. The plugin only takes one source folder into account, namely the one configured by build/sourceDirectory. This is a problem when you have multiple source folders, which is quite typical for Xtext projects, namely src and src-gen. This is reported as , which is fixed in the meantime. I have deployed a patched version as unofficial release 2.2.2. I deeply desired this plugin and this finally allows that the xtend-gen folder does not need to be checked in. The sample used here was just simple. Next would be a real life project were I want to apply the plugin, most likely in Project Spray. This project uses Xtend based code generation heavily and Maven Tycho for the build. The project has not been upgraded to Xtext 2.2.0 (of course, it was just released), and I guess we have to upgrade to Xtext 2.2.0 before we can use the plugin. But if this allows us to finally remove the xtend-gen folders from the repository this alone is worth upgrading. Until now it was always a struggle to make Xtext (or Eclipse) artifacts available on a public available repository. It seems that this has now finally found a good end. Today Achim Demelt pointed me to a Google+ posting from Dennis Huebner (our Xtext build manager) where he announced that Xtext artifacts are now automatically available on the Nexus repository at maven.eclipse.org. The given POMs have all dependencies from their bundle manifests. This is the recommended “Maven way”, but you may face that too many dependencies are pulled transitive, and you may have to cut them down by explicit exclusions. I haven’t tested this with the new repository, but this is what I experienced when doing a similar approach earlier with Xtext 2.0.1, whose artifacts are deployed on the Fornax Repository. Use the dependency:tree plugin, or better M2E, to identify possible exclusions. Although I more and more use Git for source control, I face Subversion still frequently in daily life. I follow the rule that I don’t want to check in what can be generated in a headless build, where I usually use Maven. Xtext projects have the source folders src-gen and xtend-gen, where generated sources go to. Further, you will usually have 3 projects: The grammar project, the UI project and a test project. In this article I will show some guidelines that I follow when checking in Xtext projects into source control. The content of src-gen can be produced during a build, so I do not check in the content of it. What needs to be considered is that is no good idea to ignore the folder completely, since it would be missing when fresh checking out the project. 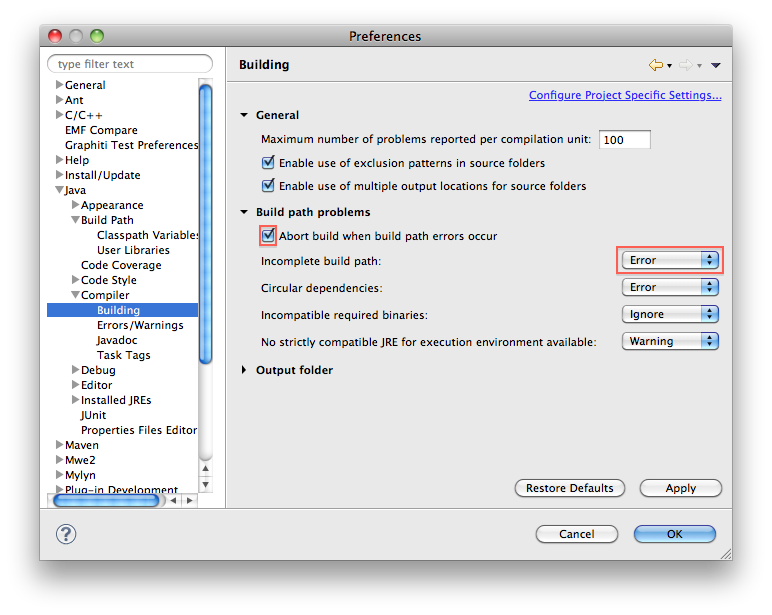 This leads to an incomplete build path, and the MWE2 workflow is not executable from Eclipse until the folder was created. This is because the .mwe2 file needs to be on the project’s classpath, which is not the folder src, but the output folder, bin or target/classes. It will be copied automatically with default workspace settings only when the build path is complete. This behavior can be changed in the workspace / project settings in Java / Compiler / Building. If you rate down build path problems to warning level or just disable build abortion on errors, the .mwe2 file will be copied anyway to the target folder. If using project specific settings you could even check in these settings and share it in the team. I prefer to check in the src-gen folder, but avoid that any content gets checked in. To do so, add the folder with svn add, but none of its content! Best you do this immediately after the Xtext project was created. After the folder was scheduled for adding, you can set the svn:ignore property to value “*”. At the moment it is not possible to compile .xtend files during a Maven build, so the content of xtend-gen must be checked in and handled like handcrafted sources. To cut this story short: Xtend and Java files depend usually on each other. Xtend files cannot be compiled until Java sources from the same project were compiled, and some Java sources will depend on about-to-be-compiled Xtend sources. So the Java source compilation fails, aborting the build. I hope to solve this problem soon.